I don’t remember how long I’ve wanted to attend, but it had been a long time for sure. The master of the ceremony talked about his own experience 50 years ago becoming a citizen and what it meant to him. He spoke of language and gender equality, he spoke about our veterans and encouraged them to teach their children about the importance of honouring Remembrance Day. He spoke about our freedom and our democracy and how important it is to vote. I loved when he talked about what makes a good citizen: caring for your family, obeying the laws, volunteering, respecting cultural differences, helping your neighbour and just generally being a good person. 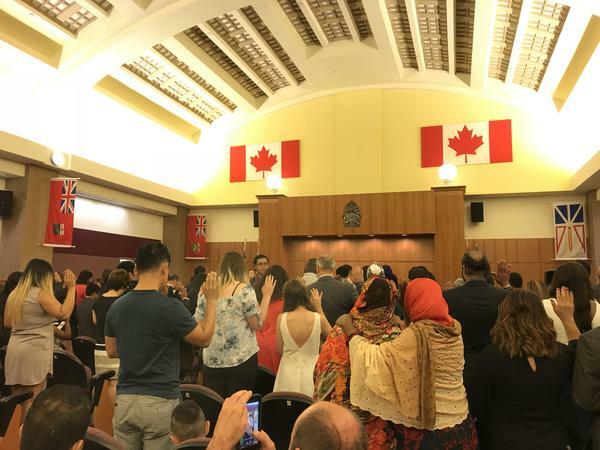 I watched a beautiful palette of skin tones proudly and joyfully go to the front of the room with small paper flags and big genuine smiles to collect their citizenship paper – something they had waited for years to obtain. Doing small, simple things to remind yourself of the big blessing you have living where you live, it’s just one more way to live Your Life, Unlimited! This entry was posted in Happiness, Newsletters, Personal Growth, Positivity and tagged e-news, happiness, personal growth, Stephanie Staples, Your Life Unlimited. Bookmark the permalink. Next Next post: Good Question!